Road Trip! Assorted card games. Old Fashioned fun for the whole family. 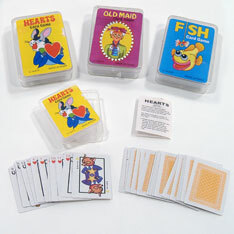 Cards are miniatures of popular children's card games. 2 ¼ inch. Sold by the dozen. Bagged 1 dozen. $2.50 per dozen for 45 dozen or more. $2.15 per dozen for 90 dozen or more.